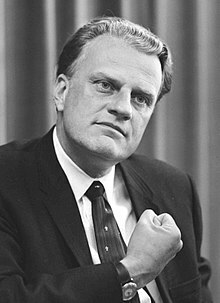 William Franklin "Billy" Graham, Jr. is an American evangelical Christian evangelist, ordained as a Southern Baptist minister, who rose to celebrity status in 1949 reaching a core constituency of middle-class, moderately conservative Protestants. He held large indoor and outdoor rallies; sermons were broadcast on radio and television, some still being re-broadcast today. In his six decades of television, Graham is principally known for hosting the annual Billy Graham Crusades, which he began in 1947, until he concluded in 2005, at the time of his retirement. He also hosted the popular radio show Hour of Decision from 1950 to 1954. He repudiated segregation and, in addition to his religious aims, helped shape the worldview of fundamentalists and evangelicals, leading them to appreciate the relationship between the Bible and contemporary secular viewpoints. William Franklin "Billy" Graham, Jr. (born November 7, 1918) is an American evangelical Christian evangelist, ordained as a Southern Baptist minister, who rose to celebrity status in 1949 reaching a core constituency of middle-class, moderately conservative Protestants. He held large indoor and outdoor rallies; sermons were broadcast on radio and television, some still being re-broadcast today. In his six decades of television, Graham is principally known for hosting the annual Billy Graham Crusades, which he began in 1947, until he concluded in 2005, at the time of his retirement. He also hosted the popular radio show Hour of Decision from 1950 to 1954. He repudiated segregation and, in addition to his religious aims, helped shape the worldview of fundamentalists and evangelicals, leading them to appreciate the relationship between the Bible and contemporary secular viewpoints. Graham was a spiritual adviser to American presidents; he was particularly close to Dwight D. Eisenhower, Lyndon B. Johnson (one of Graham's closest friends) and Richard Nixon. He insisted on integration for his revivals and crusades in 1953 and invited Martin Luther King, Jr. to preach jointly at a revival in New York City in 1957. Graham bailed King out of jail in the 1960s when King was arrested in demonstrations. He was also lifelong friends with another televangelist, Robert H. Schuller, whom Graham talked into doing his own television ministry. Graham operates a variety of media and publishing outlets. According to his staff, more than 3.2 million people have responded to the invitation at Billy Graham Crusades to "accept Jesus Christ as their personal savior". As of 2008, Graham's estimated lifetime audience, including radio and television broadcasts, topped 2.2 billion. Because of his crusades, Graham has preached the gospel to more people in person than anyone in the history of Christianity. By then his presence conferred status on presidents, acceptability on wars, shame on racial prejudice, desirability on decency, dishonor on indecency, and prestige on civic events.